Our quality and customer focus is evident in everything we manufacture, assemble, test and deliver. It’s this emphasis on quality, innovative technology and complete end-to-end manufacturing solutions that drives our business and provides our customers with significant competitive advantages in the global marketplace. Whether we’re prototyping products, launching new products, deploying the personnel needed to meet a customer’s demand or delivering shipments to a major global market, we take every measure to ensure quality and industry-leading processes. Our commitment to quality is evident in the certifications we have obtained. We are AS9100 and ISO 9001:2008 certified. We are also ISO 13485 compliant. In order to maintain this level of certification our quality documentation, quality equipment, and gauge calibration must be impeccable. To see all of the equipment we utilize to verify our quality please click the link labeled Quality Equipment List. The most recent addition to our Quality Assurance Equipment List is a Zeiss PRISMO Super Accurate Coordinate Measurement Machine. The Zeiss PRISMO is number one in the world for high-speed scanning in production. 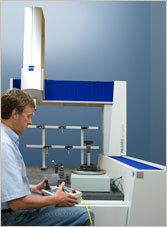 Accuracy, speed and outstanding resistance to ambient conditions are the trademarks of this measuring machine. The VAST® universal probe for multi-point or single-point measuring is used on the PRISMO navigator and adjusts to each measuring task and quickly determines size, form and position in a single measuring run to ensure our customer’s most stringent quality requirements are met. At Witco Inc., components must pass rigorous internal qualification prior to customer approval to ensure the highest level of quality and satisfaction. Witco Inc is committed to delivering excellence in performance, flexibility and technology to exceed customer expectations in quality, delivery and service. We are committed to the development, implementation and continual improvement of our Quality Management System. Zero defects is our philosophy, our vision, our state of mind. We are committed to the development, implementation and continual improvement of our Quality Management System. A track record of over 32 years in precision machining services gives us the experience and know-how to keep your project running smoothly. We use cutting-edge technologies and processes to create cost-effective solutions that address your unique requirements. No matter the industry, we have the right solution for your machining needs. Our highly experienced engineers and machinists work closely with clients for unique insights into their product requirements helping guide our development process. We help our clients develop successful projects. How? We solve problems; whether they are engineering, manufacturing or aesthetic. We ask questions, listen, and analyze the answers. Then we apply our knowledge, creativity and management expertise to bring your project to market on time and within budget.